The Herschler Building is an important asset not only because of its ideal location next to the Capitol, but also because the State can leverage existing infrastructure, which is valued at approximately $25 million in today’s dollars. The building is roughly 229,000 gross square feet, with 173,000 net assignable square feet above-grade. 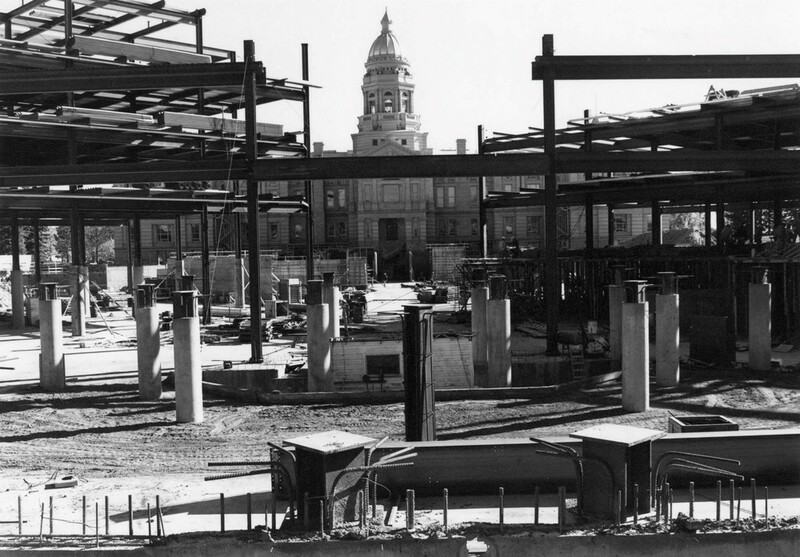 There will never be another State building as close to the Capitol as the Herschler Building. It serves a critical role in the project, providing the relief valve to reduce the pressure for office space in the Capitol, allowing the creation of larger public meeting rooms in the Capitol. The Herschler Building provides efficient access to the Capitol through the below-grade Capitol Extension, as well as the above-ground plaza between the buildings. The expanded Herschler Building will house the statewide elected officials’ staff displaced from the Capitol. The elected officials will have formal offices in the Capitol, so their staff must be located nearby. The building will provide space for displaced legislative committee chairmen and legislative staff who need to be close to public meeting rooms and the House and Senate Chambers. The physical structural system and foundation of the Herschler Building is sound. Typically, the structural system within a building accounts for approximately 20 to 25 percent of the overall costs of a building. The Herschler Building structure is valued at almost $21 million in 2015 dollars. The existing foundations extend beyond the building, allowing the opportunity for expansion of the building’s south perimeter to increase useable space. Each parking stall in the Herschler Building underground parking garage is valued at approximately $25,000. There will be about 170 parking stalls available in the underground parking structure, with a value to the State of over $4 million. The existing east and west access ramps to the parking garage will be retained. Over the past several years, the State conducted studies of properties surrounding the Capitol, but the options were not pursued. The Legislature authorized expanding the Herschler Building as the most economical alternative to meet the needs displaced from the Capitol, as well as to move State agencies out of leased space. Building an executive office building with 152,000 net assignable square feet on the former St. Mary’s property east of Capitol would cost about $92 million escalated to 2016 dollars. Constructing a State office building with 250,000 net assignable square feet on the former Safeway property on Pioneer Avenue, west of Capitol would cost about $100 million escalated to 2016 dollars. Expanding the Herschler Building adds approximately 49,000 square feet with a budget of $63 million, which includes remodeling existing space. Some of the square footage may remain unfinished to balance the project budget, but expanding and remodeling an existing building is a cost-effective way to obtain more space.